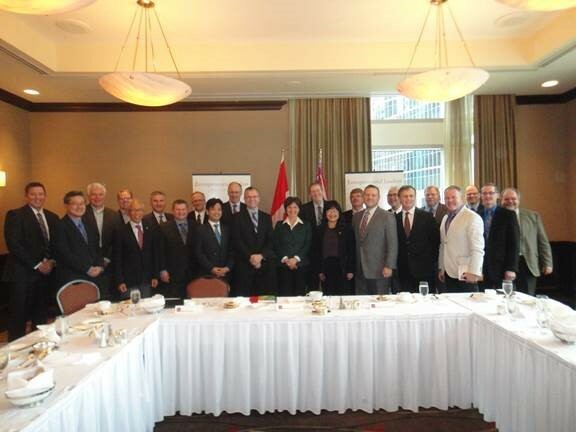 VANCOUVER, BC – March 10, 2014 - The Premier of BC, Christy Clark, was the featured guest at an ELO Roundtable held at the Terminal City Club, Vancouver, BC on March 7th, 2014 with approximately 20 of the province’s leading Christian entrepreneurs and business owners. Entrepreneurial Leaders Organization (ELO) is a Vancouver-based non-profit whose purpose is to connect, equip and celebrate Christian entrepreneurial and marketplace leaders to address social needs. ELO impacts over 50,000 people annually around the world through publications, conferences, affiliate partners and its website. ELO’s signature event is an annual conference held in Vancouver that attracts over 500 attendees locally and from around the world. ELO also organizes Roundtables to facilitate interaction between government leaders and a carefully-selected group of entrepreneurs and business leaders. In this instance, Premier Clark was able to engage in a confidential dialogue a number of BC’s leading Christian entrepreneurs and business leaders. The ELO Roundtables are invitation-only, non-media events hosted by Dr. Richard J. Goossen, Chairman, Advisory Board, ELO. Attendees represented entrepreneurs and business owners in various sectors such as hi-tech, transportation, engineering, architecture, construction, development and wealth management. Participant came from as far away as Fort St. John. The reach of the businesses represented in the room stretched throughout the Province. Premier Clark addressed questions ranging from the Liquified Natural Gas (“LNG”) initiative, education, job creation and apprenticeship training. She highlighted the importance of making sure that British Columbians benefit from the natural gas opportunity. She also has a keen interest in growing international trade. Premier Clark fielded a range of questions with aplomb. She mentioned that her own faith journey began in the Anglican church, lapsed, and then was reinvigorated when she started her own family. She believes in the value of church attendance and the reinforcement of positive values. She conceded that with her obligations as Premier that she cannot attend church as often as she would like. Premier Clark has a strong sense of personal calling. She felt compelled to lead her Liberal Party into the last election, despite the overwhelming predictions of electoral defeat. She reasoned that if she didn’t rise to the challenge, who would. She felt called to give her best efforts in the last election. She admitted that this was a challenging time, but her stunning electoral victory was the proof that she decided wisely. Perhaps the message that came through most clearly from the Roundtable was one that was unspoken and, indeed, related to her recent electoral success. Attendees sensed Premier Clark’s magnetism and authenticity. She has an ability to connect with people and is very engaging. A litmus test for successful politicians is often reduced to: would I want to have a beer/coffee with that person? In her case, the answer is clearly yes.